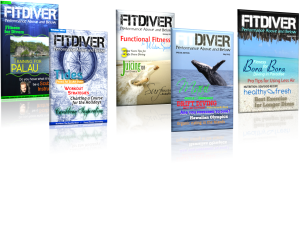 Stay motivated with the FitDiver® Magazine. 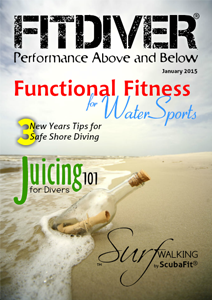 Each issue is filled with timely fitness and nutrition information for divers. Tips for staying in shape, FitDiver® Faves, and new exercises help keep you on track with your fitness for diving goals. Bora Bora is big and beautiful. 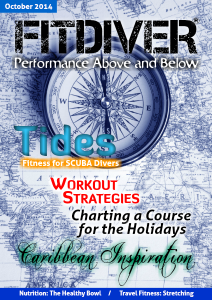 Training tools and tips from the pros guide divers toward improved performance. Learn the most important form of exercise for all divers, try a fresh seafood recipe, and be inspired to fitness by images of tropical islands, white sandy beaches and crystal clear lagoons. Aloha! Get in shape for SCUBA diving in Maui. This SPECIAL EDITION integrates the ancient Hawaiian culture of a well-balanced and healthy lifestyle with modern day nutrition and fitness. Island vistas, sea breezes and Humpback whales inspire divers to prepare for spectacular experiences that strengthen the body and nourish the spirit.